If you haven’t guessed from the title, this post is about dairy. Last summer, whilst on a diet, my skin became quite bad. Through a process of elimination, I realised that it was milk and certain cheese that angered my face. After cutting out these products, my skin showed an instant improvement. My findings were strengthened in Elle UK. The April issue of Elle features a brilliant article about dairy products, ‘Truth About Dairy’. There are so many quotes I would love to share with you, but that will have to wait until I get my copy back — I left it at university and Elle May is now gracing the shelves. What the article outlines are the reasons that cow’s milk is unsuitable for humans. I am not a scientist, but the general gist is that a lot of humans do not have enough of the enzyme, lactase. Lactase is needed to breakdown lactose (the sugar found in dairy). Approximately 70% of people show some degree of lactose intolerance (it does not have to be severe). Since January, my diet has not been particularly healthy. It is time to replace my love of bagels for breakfast, with Weetabix again. Ah, but what to pour over them asked Goldilocks? Rice milk? Too high in carbohydrates. I very much enjoyed my first encounter with almond milk today. It’s slightly sweeter than cow’s milk, which is great because I no longer need to cover my Weetabix in sugar (The Silly Asparagus has a very sweet tooth). 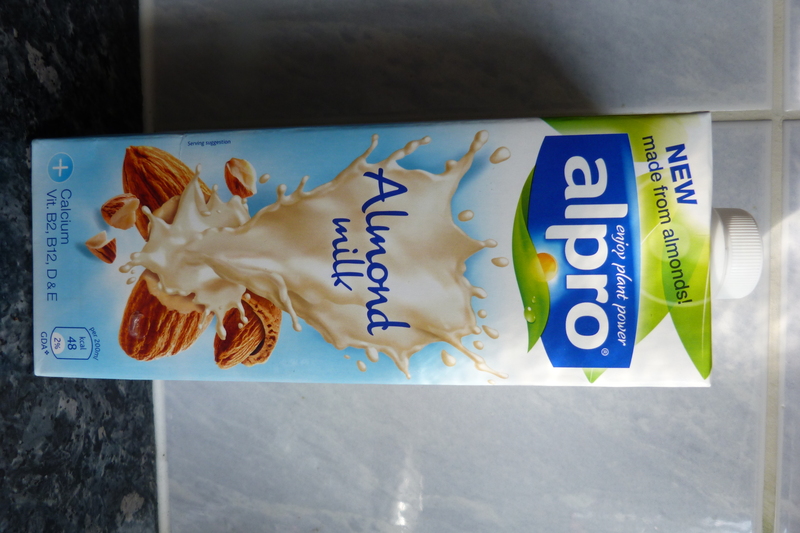 Almond milk is suitable for vegans and high in antioxidants. Other benefits include being lower in fat and calories than semi-skimmed milk. If you are anything like Mother Asparagus, you will start defending cow’s milk. What about calcium? Almond matches semi-skimmed to the milligram when it comes to calcium. Foods like sesame seeds and nuts contain more calcium than cow’s milk. Okay, B12? Eggs contain more B12 than cow’s milk. If you are a peschatarian, clams and mackerel are extremely high in B12. Protein? Pumpkin, squash, nuts and cheese are just some of the products that have higher protein levels than milk. For Vitamin C, think peppers, broccoli, kiwi and orange. I have not even reached the ethical questions that surround the treatment of animals in the dairy industry. I won’t discuss ethics now. However, I remember vegan tutor (learn more about him here: https://sillyasparagus.wordpress.com/2011/12/02/day-4-im-spartacus/) shuddering over dairy, stating that “The dairy industry is even crueller than the meat industry”. Well, I hope that has given you some food for thought. Time to get back to my Weetabix. This entry was posted in Food, Health, Vegan, Vegetarian and tagged almond milk, B12, cow's milk, dairy, Elle Magazine, Elle UK, food, Lactose intolerant, vegan, vegetarian by Collette Naden. Bookmark the permalink.